ROTARY/PUNCH BROACHES can be used in a variety of machines to cut polygons in blind holes. Any type of CNC or manual turning, milling, drilling or screw machine. 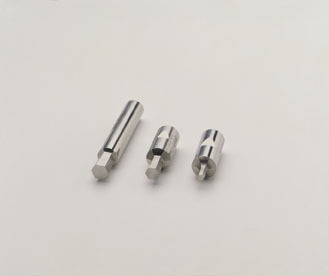 The practical forming length of rotary/punch broaching is usually up to 1-1/2 times the size of the broach (measured across flats). ROTARY BROACH HOLDERS: For optimal tool life in large production settings these broaches are used in Rotary Broach Holders. Holders and broaches are sold separately. blind holes: Any type of CNC or manual turning, milling, drilling or screw machine. the size of the broach (measured across flats). polygon shape into the work piece (wobbling type action). larger than the largest dimension of the broach face (distance across points). instructions are included with purchase of the tool holder. of .016 times the size of the broach in inches for a feed rate in IPR units. .016 x .250 = .004/rev. not be able to escape, causing inability to broach to full depth. tool life. Coatings are also available.